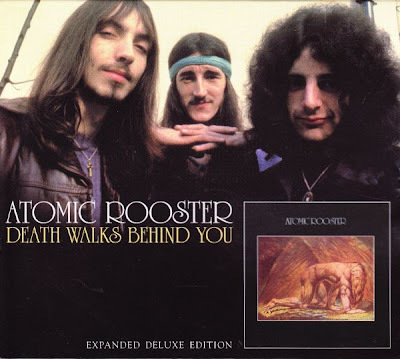 For the second incarnation of Atomic Rooster, Vincent Crane teamed up with the talented guitarist John Cann, previously in Andromeda, and his own left hand on the keys for bass. Ric Parnell served a brief spell behind the drum kit, but not before Cann brought in the very underrated John Hammond on drums instead. Crane's obsession with the darker side of the psyche was fairly unique at the time and as the title suggests, the album had no shortage of gloom and doom. Early in 1971, the band released their sophomore album, Death Walks Behind You. A consistently heavy rock affair, it was distinguished by Cann’s guitar playing, but not his vocals as the title track attests. The instrumental "Vug" however kicks into high gear and the interplay between Crane’s organ and Cann’s guitar is electric. Bluesy and ballsy, it’s indicative of their heavy chomping sound. "Gershatzer" is another instrumental barnstormer, with Hammond this time showing his wares. Several Cann compositions grace the record, the best "Seven Lonely Streets", fitted with a shimmering organ arrangement. Crane switches to piano for the more accomplished melody of "Nobody Else", a precursor to what the next album would have in store. The single "Tomorrow Night" climbed just shy of the UK Top 10, while the album reached No. 12, even breaking into the US Top 100, where the band had signed to Elektra Records. 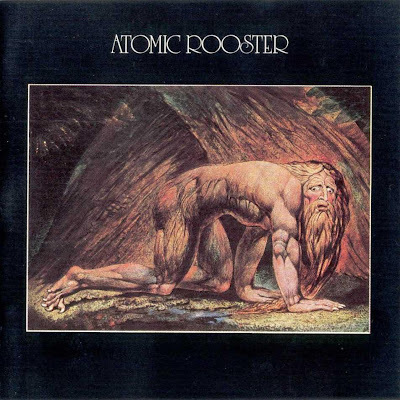 Produced by ATOMIC ROOSTER in conjunction with The Robert Stigwood Group Ltd.
Sleeve design by ATOMIC ROOSTER/Robert Stigwood Group Ltd.
Sleeve notes by Vincent Crane.